Steve Becker, 67, of Ames, died Saturday March 16, 2019 at his home after a lengthy illness. A Memorial service will be held at 1:00 PM on Monday, April 1 at Harvest Vineyard Church, 320 South 17th St. Ames, IA. Burial will be in the Atlantic Cemetery at a later date. Steven King Becker was born October 28, 1951 in Atlantic, IA the son of Fredrick J (Ted) Becker and Pearl Lillian (Gearheart) Becker. Steve attended Lincoln School in Atlantic and later lived at the Glenwood State School, Glenwood. He enjoyed bowling, playing cards, participating in the Special Olympics and listening to Johnny Cash and Tony Orlando albums. Steve is survived by his 10 siblings: Bethany (Daniel) Meyer of Gilbert, IA, Jeffrey Becker (Sharon) of Ames, IA, Cameron Sims of Fort Lauderdale, FL, Trenton Becker (Tina) of Gilbert, IA, Treynor Becker (Carrie) of Charles City, IA, Tiffany Becker of Raleigh, NC, Trimble Becker of Washington D.C., K.C. Becker of Washington D.C., Benton Becker (Mica) of Pompano Beach, FL, and Coey Becker of Washington, D.C; nieces and nephews: Mindan Lytle (Meyer), Mikade, Dani and Bret Meyer, Andrea and Zach Becker, Storm and Cairo Sims, Tyler Canine, Joseph, Katherine, Hannah and Isaac Becker, Quintin and Madison Becker, Darian Becker, and Braelynn Becker; several great nieces and nephews and several aunts and uncles. He was preceded in death by his parents, Fredrick (Ted) Becker and Pearl Lillian (Gearheart) Becker, his step mother Dorothy Becker, his maternal grandmother, Maude Gearheart, paternal grandparents Dr. Royal A and Emma "Lou" Becker, uncles Robert L Becker and Floyd Gearheart, Bill Donnelly and aunt Issabel Donnelly. 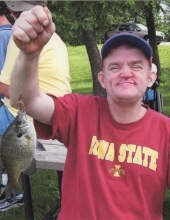 Memorials can be directed to the Iowa Special Olympics, 550 South Dovetail Road, PO Box 620 Grimes, IA 50111 or Friendship Ark, 130 South Sheldon Ave, P.O. Box 203, Ames, IA 50014. To send flowers or a remembrance gift to the family of Steven Becker, please visit our Tribute Store. "Email Address" would like to share the life celebration of Steven Becker. Click on the "link" to go to share a favorite memory or leave a condolence message for the family.